This ancient Greek tragedy presents a spectacle of the torment, rage, and revenge endured and enacted by women who, Euripides realized, suffer first and most from war. 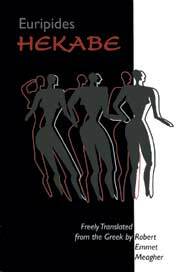 In Hekabe, the fate of the bereaved queen of Troy is a testament to the dehumanizing rather than ennobling effects of intense and prolonged suffering. As long as we live in a world all but defined by violence, the ancient voice of Euripides Hekabe will offer compelling witness to the courage and solidarity of those who suffer it most and a fierce challenge to the simplistic assurance that suffering is somehow for the better of us all. As an actress who has performed Greek tragedy in English, I feel a very strong admiration for Robert E. Meagher. He has a talent for making a classical text spring to life, remaining true to the author while investing it with the poetic immediacy of an original work. Mr. Meagher certainly knows how to write for actors. Not only has he a true sense of dramatic construction, but his dialogue is always sharp, frequently daring, and invariably extremely actable. We need playwrights like him. Robert Meagher is the finest living translator of Greek drama. Robert Meagher has been progressively making a considerable name for himself as an interpreter, translator and producer of Greek tragedy, particularly Euripides... Meagher is achieving something which these other translators [referring to James Michie, Colin Leach, and Richmond Lattimore] are not perhaps striving for, something credibly actable, and as such he is performing a great service for Euripides and the Classics in general.